Soleil - Height 59", Radius 33"
Most houses have a good space for a mobile, and most people find that a mobile enlivens a room. I often watch a mobile over my desk as it casts a shifting, beautifully intricate shadow on the wall. Most of my mobiles are made of aluminum sheet and stainless steel wire and are painted with artists’ acrylic. Recently, however, I have been making more mobiles of hammered shapes in aluminum, bronze and brass. 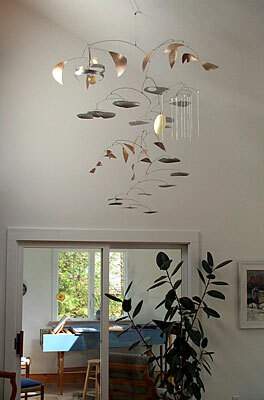 The mobiles I’ve made for residences range in size from three to eight feet in height and diameter. While most of my work is abstract, I do sometimes include fish and birds, or sun, moon and stars. I’ve even made an occasional UFO. In thinking about placing a mobile, note that they work best against a fairly plain background. Cathedral ceilings are of course ideal, corners are congenial, and I’ve hung mobiles in stairwells and over tables and pianos. Click any of the small images below to see a larger view.